Sustainability is part of Siemens’ core business activities. It helps us mitigate risks and exploit business opportunities, especially in the field of energy and resource efficiency. We consider sustainability along the entire value chain—setting standards for our suppliers, sustainably managing our operations and providing customers with innovative, resource efficient products and services along the entire life cycle. These enable them to reduce energy cost and decrease their own carbon footprints. With revenue of 33.0 billion euros in fiscal year 2014, the Siemens Environmental Portfolio is proof of how sustainable technologies are part of Siemens’ core business. On top of this, our contribution to society is demonstrated by the fact that we enabled our customers to reduce their CO2 emissions by 428 million metric tons in fiscal year 2014 and by the access to Siemens medical imaging technologies for 1,080 million people in emerging countries. For a successful implementation of sustainability in the organization, it is essential to have it anchored in the top management, supported by an effective and coordinated structure covering businesses, corporate functions and countries. Global Footprint Network. (2014). World Footprint. http://www.footprintnetwork.org/en/index.php/GFN/page/world_footprint/. Accessed 2 May 2014. Siemens. (2014b). One Siemens. www.siemens.com/one-siemens. Accessed 2 May 2014. Siemens. (2014c). 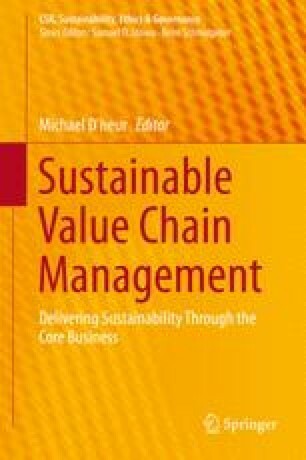 Sustainability in the supply chain. https://w9.siemens.com/cms/supply-chain-management/en/sustainability/detection/Pages/detection.aspx. Accessed 2 May 2014. Siemens (2014d). Web-based Training https://w9.siemens.com/cms/supply-chain-management/en/sustainability/supplier-development/web-based/Pages/trainings.aspx. Accessed 2 May 2014. Siemens. (2014e). Siemens integrity initiative. www.siemens.com/integrity-initiative. Accessed 2 May 2014. Siemens. (2014f). Leading you to energy efficiency – Siemens environmental portfolio. https://www.siemens.com/sustainability/pool/umweltportfolio/siemens_environmental_portfolio.pdf. Accessed 2 May 2014. SRE (2014) Siemens real estate. http://www.siemens.com/about/en/businesses/siemens_real_estate.htm. Accessed 2 May 2014. The Economist. (2013). Bangladesh’s clothing industry: Bursting at the seams. http://www.economist.com/news/business/21588393-workers-continue-die-unsafe-factories-industry-keeps-booming-bursting-seams. Accessed 2 May 2014. UNDP (2014) Human Development Index (HDI). http://hdr.undp.org/en/statistics/hdi. Accessed 02. May 2014. WWF. (2012). Living planet report 2012. http://wwf.panda.org/about_our_earth/all_publications/living_planet_report/2012_lpr/. Accessed 2 May 2014.